Birthdays and anniversaries can be tracked for each Outlook contact. Both are saved as all-day annually recurring events which appear in the calendar and To-Do Bar. In an open contact, on the Contact menu, click Details. Enter the date in the Birthday or Anniversary box. By default, a reminder is added to birthdays and anniversaries. By default, Outlook's reminder for all-day events is set for 15 minutes before the event starts. This means that the reminder will display 15 minutes before the start of the calendar day, or 15 minutes before midnight. If you want reminders for birthdays and anniversaries further in advance, open the series on your calendar and change the reminder time. In Calendar, press CTRL+G to jump to a specific date in your calendar. Then enter the date of the birthday or anniversary you want to change. The birthday or anniversary appears at the top of the calendar grid for the specified day. 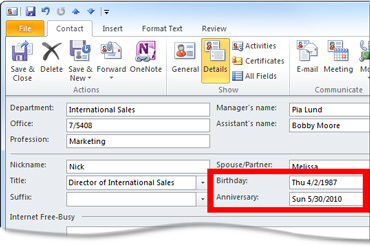 Double-click the birthday or anniversary to open the Open Recurring Item dialog box. Click Open the series, and then click OK.
On the Recurring Event tab, in the Options group, change the Reminder time. You can click a reminder time of up to two weeks in advance of the event. In the Actions group, click Save & Close.